A Russian Zenit-2 launch vehicle lofted Russia’s Fobos-Grunt spacecraft into orbit – launching at 02:16 local time on Wednesday from the Baikonur Cosmodrome – ahead of its sample return mission to Phobos, along with China’s first Mars probe, Yinghuo-1. However, both of the two planned burns to send it on its way to Mars failed, related to problems with the flight computer. Controllers have three days to work the issue before the mission is lost. The name Fobos-Grunt, “Фобос-Грунт” in Russian, means “Phobos Soil”, although it has frequently been mistranslated as “Phobos Grunt”, even by the Russian Space Agency, Roskosmos, itself. Yinghuo-1, “萤火” in simplified Chinese, means “Firefly”. Fobos-Grunt is an ambitious sample-return mission to Mars’ larger natural satellite, Phobos. Discovered by Asaph Hall in August 1877, Phobos has a diameter of approximately 22 kilometres, and orbits Mars once every seven hours and forty minutes. 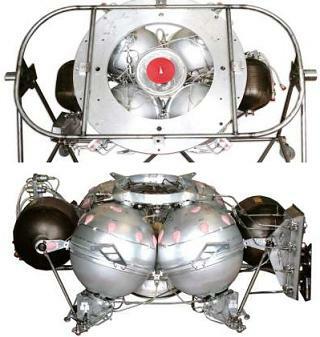 Fobos-Grunt is the third dedicated mission to Phobos, the previous two missions, Fobos-1 and Fobos-2, were launched in 1988 by the Soviet Union, however both failed. Fobos-2 did return some images, one of which formed the basis of a conspiracy theory that the probe detected an alien spacecraft. The theory was quickly dismissed, and has little credibility. With a mass of 13,500 kilograms, Fobos-Grunt is the largest planetary spacecraft ever built in the former Soviet Union, however this mass includes a large amount of fuel, since the spacecraft will be deployed into low Earth orbit, and will have to perform its own injections into heliocentric and areocentric orbits. It is the first sample return mission to the natural satellite of another planet, and the first such mission to be conducted by Russia. If the mission is successful, it will be the first successful Russian planetary exploration mission, following the loss of the Mars-96 spacecraft in a launch failure. Fobos-Grunt is carrying 20 instruments. The Gas Analytic Package, or GAP, will conduct gas chromatography of the soil of Phobos, and look for organic compounds. The Manipulator Instruments Set will study the composition if the soil through spectroscopy. A large array of other spectrometers are also aboard the spacecraft, including a gamma-ray spectrometer, a neutron spectrometer, an infrared spectrometer, a laser mass spectrometer, an ionic mass spectrometer, a visible optical spectrometer and an infrared optical spectrometer. These will study different elements of the soil’s composition. The Thermal Sensor will study layers of rock, to investigate their thermal properties. 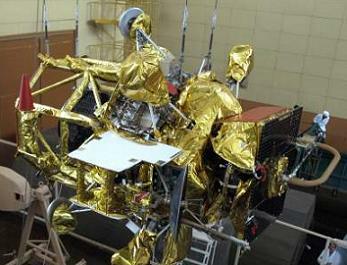 The Long Wave Penetrating Radar will be used along with a seismometer to study the internal structure of Phobos. Two cameras are also present, a navigation camera which will be used to aid with the spacecraft’s landing, and for mapping, and a panoramic camera to produce detailed images of the moon. Six of the instruments aboard the spacecraft will be used to study the spacecraft’s environment and Mars itself, rather than Phobos. Two dust counters are aboard the spacecraft, with one being used to detect micrometeoroids, and the other to study the dispersal of dust in Phobos’ orbit. The TIMM-2 spectrometer will be used to look for trace gasses in the atmosphere of Mars, the Plasma Science Package will investigate the effects of the Mars and Phobos and the Solar wind upon each other. The two remaining experiments are a Solar sensor, and the Ultra-Stable Oscillator. 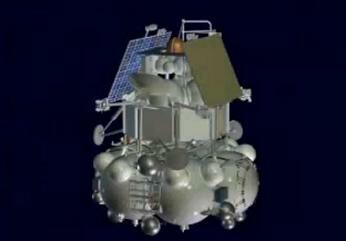 Yinghuo-1 is the first Chinese mission beyond the Earth-Moon system. It is a small spacecraft with a mass of 110 kilograms, and is expected to operate for around a year upon reaching Mars. It carries electron and ion analysers, a mass spectrometer, a magnetometer, a radio-occultation sounder and two cameras. Its ionospheric experiments will be conducted in conjunction with those aboard Fobos-Grunt. The cruise stage which will propel Fobos-Grunt from an initial low Earth orbit with a perigee of 207 kilometres and an apogee of 347 kilometres into orbit around Mars is derived from the Fregat stage. Fregat has been used since 2000 as an upper stage for Soyuz-U, Soyuz-FG, Soyuz-2 and Zenit rockets, and is powered by an S5.98M engine using unsymmetrical dimethylhydrazine as propellant and nitrogen tetroxide as an oxidiser. The launch of Fobos-Grunt is the seventy sixth launch of a Zenit rocket, and its thirty eighth launch in a two-stage configuration. Development of the Zenit rocket began in 1976, with a one-stage version intended to be used as boosters on the Energia rocket, and a two stage version, the Zenit-2, seen as a replacement for the R-7 and Tsyklon families of rockets. After a delayed development programme due to problems maintaining the combustion stability of the RD-170 series engines, the Zenit-2 made its maiden flight on 13 April 1985; however the suborbital test launch was unsuccessful. The second launch, conducted on 21 June 1985, was successful, with the vehicle overperforming and ending up in low Earth orbit, despite only a suborbital flight having been planned. To date, this remains the only recorded case of an object being accidentally placed into orbit. On 22 October 1985, the Zenit-2 made its first intentional orbital launch carrying Kosmos 1697, a mass simulator of a Tselina-2 electronic signals intelligence satellite. Following the collapse of the Soviet Union, the Zenit became a Ukrainian rocket, and as such Russia decided against mass-producing it as a Soyuz replacement, and it was phased out of use for military launches; however it has found some success in the commercial launch market. In September 1999, the first commercial launch of a Zenit rocket was conducted, when a Zenit-2 lifted off from the Baikonur Cosmodrome carrying twelve Globalstar communications satellites. That launch was unsuccessful, however six months later the Zenit-3SL, a three-stage variant dedicated to commercial launches, made its maiden flight. Operated by Sea Launch, and launched from the Odyssey mobile platform positioned at the equator, the Zenit-3SL consists of a Zenit-2S, a modified version of the Zenit-2, with a modified Blok DM upper stage. To date, thirty one Zenit-3SL launches have been made from Odyssey by Sea Launch, the most recent occurring this September with the Atlantic Bird 7 spacecraft. Following the initial success of Sea Launch, a subsidiary, Land Launch, was set up to offer launches from Baikonur. The Zenit-3SLB, a three-stage variant optimised to launch from Baikonur, made its maiden flight in April 2008, carrying the Amos 3 satellite. 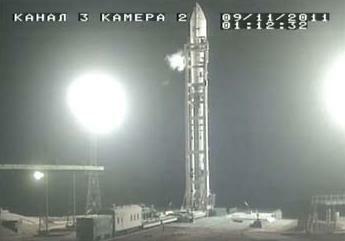 Five Land Launch missions have been conducted to date. By 2007, the stock of original Zenit-2 rockets appeared to have been depleted, and the last Tselina-2 satellite was launched by a new variant, the Zenit-2M, which featured improvements developed for the Sea Launch and Land Launch programmes, including uprated engines, modernised guidance and computer systems, and weight reductions. The two-stage Zenit-2M, which is also known as the Zenit-2SB, is offered by Land Launch as the Zenit-2SLB, however a commercial launch is yet to be ordered or conducted. The Zenit-3F, which is also known as the Zenit-3SLBF and the Zenit-2SB/Fregat, is an alternative three-stage configuration which first flew in January, and incorporates a Fregat upper stage in place of the Blok-DM used on the Zenit-3SLB. It has made two launches so far, carrying the Elektro-L No.1 weather satellite, and the Spektr-R astronomy satellite, into orbit. The naming of Zenit rockets has caused some confusion, with many configurations being known by several names, and the designations painted on the rocket itself often not matching those used in press releases and news articles in the leadup to the launch. Fobos-Grunt was launched by a rocket which has been identified as a both a Zenit-2SB and a Zenit-2FG, and which is to all intents and purposes the second flight of the Zenit-2M configuration, albeit with a different payload fairing and adaptor. Of the two ‘official’ designations, the former is used to identify variants of the Zenit-2S which have been modernised and optimised for launch from Baikonur, whilst the latter appears to refer to modifications made to the rocket to accommodate the Fobos-Grunt spacecraft. The Zenit which was used to launch Fobos-Grunt is the two-stage Zenit-2SB41, with the digits ’41’ referring to the variations on the standard Zenit-2SB configuration for this mission. The Zenit-2M configuration with a normal payload is designated Zenit-2SB40, whilst the configurations used as the first two stages of the three-stage Zenit-3SLB and 3F configurations are designated the Zenit-2SB60 and 2SB80 respectively. Based on the general flight profile for a two-stage Zenit launch to low Earth orbit, the first stage’s single RD-171M engine ignited when the countdown reached zero, and about 3.9 seconds later liftoff was initiated, with the Zenit beginning its climb away from Baikonur. Ten second after T-0, the rocket began a roll to the correct flight azimuth, and a second later it pitched over to attain the necessary attitude for its ascent. The roll manoeuvre was completed about 14 seconds after ignition. A minute into the flight, the vehicle passed through the area of maximum dynamic pressure, and fifty three second later it reached peak axial acceleration, at which point the RD-171M throttled down to half of its rated thrust for nineteen seconds. Two minutes and 25 seconds after launch, the second stage’s RD-8 vernier engine ignited. Two seconds later, the first stage burnt out, with separation occurring a further two seconds after that. Ignition of the RD-120 main engine of the second stage came six seconds after staging. Separation of the payload fairing occurred when the atmospheric density outside the vehicle was sufficiently thin that it would not cause damage to the spacecraft – something which varies depending upon the payload. However, for a generic mission described in the Land Launch Users’ Manual, separation occurs about five seconds short of five minutes into the flight. The end of the second stage’s burn depends entirely upon payload requirements, specifically its mass and target orbit. Following shutdown of the second stage main engine, the vernier may continue to burn for some time. Once they had been shut down, Fobos-Grunt separated, and solid rocket motors on the second stage fired to increase the separation distance between the spent stage and the payload. Two and a half hours after launch, Fobos-Grunt was set to perform an orbit-raising manoeuvre, prior to a second burn 126 minutes later, which would have taken it into heliocentric orbit to begin its journey to Mars. Both burns failed. Believed to be related to a problem with the flight computer, which is now understood to be in safe mode, Russian officials told Interfax that they have three days to resolve the software issue before the battery power on the spacecraft runs out. If the problem is software related, controllers may be able to upload corrective lines of code. However, if the problem is hardware related, the mission will likely be lost. See live coverage link for live updates. Fobos-Grunt will take eleven months to reach Mars, performing three course corrections along the way. Orbital insertion is planned for 9 October next year, when the spacecraft will enter an orbit with a periareion of about 800 kilometres, and an apoareion of around 80,000 kilometres. Following insertion, Yinghuo-1 will separate from Fobos-Grunt and begin its mission. 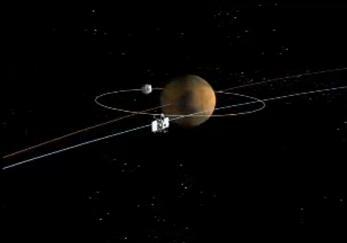 By January 2013, Fobos-Grunt will be in a 10,000 kilometre circular orbit around Mars, and will enter a quasi-orbit around Phobos in early February, before landing on the satellite later that month. In either late February or March, the spacecraft’s return module will lift back off from Phobos, and return to heliocentric orbit for the journey back to Earth. It is expected to arrive at Earth in August 2014. The Zenit was launched from Pad 1 of Area 45 at the Baikonur Cosmodrome. The first Zenit launch complex to be built, Pad 1 has been used for all but two of the Zenit launches conducted from Baikonur (excluding those launched as part of Energia rockets). The launch of Fobos-Grunt is the forty fourth to use the pad, and the forty sixth launch in total from Area 45, which was first used in 1985 for the Zenit-2’s maiden flight. Area 45 originally consisted of two pads, with the other pad, 45/2, being first used on 22 May 1990 for the launch of Kosmos 2082, or Tselina-2 No.9. The second and last launch from Pad 2 occurred on 4 October 1990, with Tselina-2 No.10. Following a first stage engine failure three or five seconds after launch, the rocket fell back into the flame trench and exploded. The explosion caused a metal structure with a mass of 1,000 tonnes to be blown 20 metres into the air, blew panels off the pad’s service tower, damaged lighting masts several hundred metres away, and scattered debris within a three kilometre radius. The pad was never rebuilt. Wednesday’s launch is the first of two launches towards Mars during this year’s launch window. Launch opportunities for missions to Mars occur for about two months every 780 days, depending on the mass of the payload and the performance of the rocket launching it. The two month period is centred around the date at which the Earth and Mars are positioned such that a minimum-energy transfer can be made between the two planets. This repeats every 780 days due to the synodic period of the two planets. 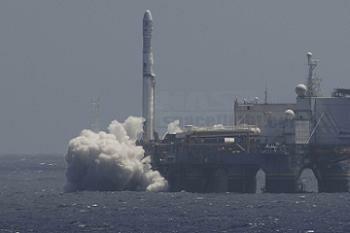 Due to construction delays, Fobos-Grunt missed the last launch window, which occurred in late 2009, when it was expected to be launched. The Mars Science Laboratory is scheduled to launch aboard an Atlas V rocket at the end of the month, marking the second launch of the window.